Looking to earn some money while writing online?Â Try Infobarrel. For kids that love to be creative and build their creations, a kids tool bench can be a terrific way to inspire them to do just that. Many children enjoy watching their dad or grandfather work in the garage or shed, and the kids wish that they could help out. However, there is just one problem. Despite their protests, you probably do not want small kids handling real drills, hammers, nails, and electricity. With a miniature tool bench for your kids, little builders can realistically pretend to do all of the things that the see their construction role models do in the garage. So which one to buy? Here are some good tool benches for kids from Step2, Alex Toys, Mega Brands and CAT, and KidKraft. The Step2 Deluxe Workshop has a large workspace and comes with a 50 piece accessory set. This accessory set includes a battery-powered drill, 2 drill bits, 8 nuts, 8 screws, saw, hammer, pliers, adjustable wrench, screw driver, 17 wood pieces, vice, and shop vac. Without a doubt, it gives a child everything they could hope for in a kids tool bench. The drill makes realistic sounds and the workbench includes built in holes so that the builder can get a realistic feel. There is also a cabinet that resembles a tool chest. The "wood" pieces are made from indestructible Durafoam, and the set includes instructions for 4 projects. 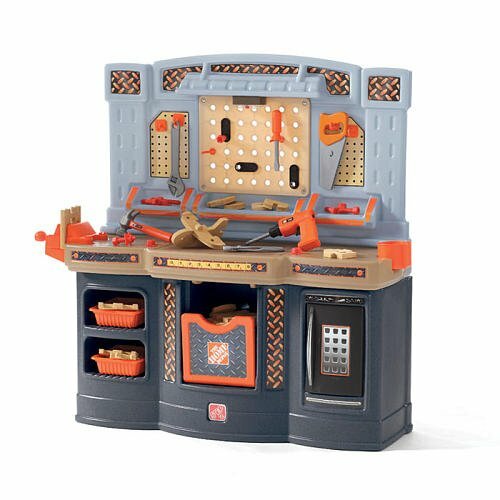 The Alex Toys work bench has been a recipient of Dr. Toy's 100 Best Children's Product Award. It comes with 36 colorful tools including a hammer, screwdriver, wrench, saw, carpenter's square, vice, nuts, bolts, connectors, and wooden pegs. When the tools are no longer in use, they can be hung on the pegs that stick out of the back of the bench. One thing to be aware of is that it is made of wood, and the tools are also wooden. So there is the possibility that with rough play, pieces could be broken off. The Mega Brands CAT Workbench is unique in that it is made with toddlers in mind. Unlike the others on this page, the Mega Brands bench does not have extremely small parts, thus the manufacturer says it is suitable for kids as young as 1 year old. The top lid of the storage bin serves as a building plate where the pieces can be assembled. This work bench has Lego-like plastic pieces that fit together, and it includes a plastic hammer screwdriver and wrench. It is not as realistic as other benches, but it can still stimulate a small child's imagination and creativity. Plus, when they are all through, you can simply store everything in the bin until next time. The KidKraft 72 Piece Activity Kids Tool Bench is a colorful bench that includes many pegs and holes that can keep little builders busy for a long time. 3 all-wood tools are included, a screwdriver, hammer, and wrench, as well as a no pinch solid wood vice. There is also a built in storage tray to stow everything away when they set is not being played with. If the tool bench for your kids you want is on this page, or even if it is not, then you can find them at several places, including Walmart and Target. If you like to be able to shop easily and conveniently, there are also play tool benches online. However you decide to buy one, whether you want it inexpensively or are willing to spend some money, you can place it inside or outside and be confident that your creative little boy or girl will enjoy having their very own kids tool bench.